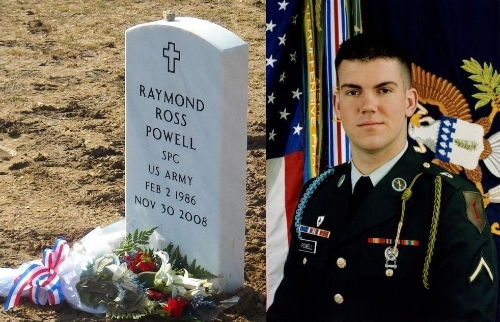 Specialist Raymond Powell was born February 2, 1986 at Fort Worth, Texas to Mrs. Nannette Powell and Mr. Randy Powell. SPC Powell distinguished himself from other teenagers by entering the United States Army July 26 , 2005. SPC Powell conducting his initial infantry and basic training at Fort Benning, Georgia; there after completing his advanced individualized training as an 11B, Infantryman January 2006. SPC Powell was assigned to the 1st Battalion 26 th Infantry Regiment in Germany, where he exceptionally served an 11 month tour in Iraq. SPC Powell was later re-assigned to the United States Military Academy Preparatory School at West Point in July 2007 as Cadre Support. SPC Powell was later re-assigned to Fort Benning, Georgia with Alpha Company, 2nd Battalion 29 th Infantry Regiment. While assigned to Fort Benning, SPC Powell served as Range Support for the U.S, Army Infantry School. SPC Powell's service and numerous achievements were recognized by the awarding of the Army Accommodation Medal (2nd Award), Army Achievement Medal (2nd Award), National Defense Service Medal (1st Award), Iraq Campaign Medal (1st Award), Global War on Terrorism Service Medal (1st Award), Army Service Medal, Overseas Service Medal (2nd Award), and the Combat Infantryman Badge (1st Award). SPC Powell's exceptional tutelage also earned him the Distinctive Instructor Qualification. SPC Raymond Ross Powell was known to his peers and comrades as an outgoing, courageous and very out spoken individual. His personality and charm echoed throughout this unit. His closet friends most admirable attributes, as by SSG Shower's and SSG Parker, "Powell was never afraid to speak his mind, and could talk himself out of almost anything". When given the opportunity and resources, once he put his mind to it he could get anything accomplished." SPC Powell was determined to accomplish all tasks with minimal assistance; always self-reliant. One of his greatest qualities was his humor and positive outlook in any situation. When he was seen off duty, he was seen with a smile on his face and most likely his favorite shorts, broadcasting his loyalty to the Georgia Bulldogs as their greatest fan.